RedMart hosted its first ever Foods&Goods Market on 1-2 Dec 2018 at The Working Capitol. Foodsterr participated in this event, providing food tasting samples for visitors of the event. healthy granola using all Foodsterr products. All images taken by RedMart Imaging Team (Jeremy Chua). Lots of dads fancy themselves foodies, but imagine how cool it would be to have a Dad who worked with the tastiest ingredients around? As CEO of Foodsterr, an online grocery store for healthy eating, Nehal Patel sources the best quality ingredients (including nuts, grains and all manner of superfoods) and brings them to Singapore at a great price. We are totally addicted! Nehal is also the doting father (check out the totally adorable photos below for evidence) of 8-year-old Rhea. We caught up with the father-daughter pair near Robertson Quay to get their picks for the best spots to eat and play in Singapore! And if you want to get more Foodsterr into your life, mama, you can also find it at RedMart, Amazon, HonestBee, Jones the Grocer, The Providore… basically anywhere that has delicious food in the Little Red Dot! In high school and college, I used to be a DJ. I used to have a slot at my college radio station and have also done events in high school. We use the canal by the river very often to go for a walk, bike or scooter ride. It’s a really nice place to get some fresh air right outside our place. Blu Kouzina in Dempsey – my daughter loves their roast chicken and the tzatziki dip. I am big fan of everything on the menu, especially their appetizers. They have a very strong focus on using the best ingredients and it really comes across in the dishes. Do you do any cooking in the house? If so what do you make? Yes, the majority of our meals are home cooked. I admit, I don’t cook as much as I like but I do grill when I can. Recently, I have started to make fresh granola from Foodsterr ingredients. I cannot go back to a packaged product anymore! We live in River Valley. We love the proximity to all the areas we visit – Robertson Quay, Tiong Bahru, Dempsey and Orchard. There are so many selections – whether it’s restaurants, shopping, parks, bike paths, in a small area makes the location really appealing. Haven’t used this in a while but when I did, ION was the best. The water play area at Gardens by the Bay trumps all. It’s a great place for kids to run around to beat the heat and then have a bite at Satay by the Bay. I trust only Nespresso with my coffee making. I own two machines – one at home and one at work. I am on the path to get another one to travel with. Good Night Stories for Rebel Girls – these stories of how women all over the world and throughout history have overcome stereotypes, fears or pressures is our favourite bedtime reading. Any favorite apps/games to play with your kids? It’s a bit old school but it’s board games like Monopoly or Pictionary that gets us going. We are a competitive lot. Water parks are the places we go to when Mom is not around – Pasir Ris Waterpark and Adventure Cove top the list! It’s become more of a date night bar when it happen,s but Manhattan at the Regent is one of our favourites. The ambiance, drinks and food are top notch. Pylones in Wheelock Place. Great French design oriented store that carries everything from funky scissors to quirky butter knives. I use the pool in my condo and like to use the bike path on the river for cycling, running or walking. I also enjoy tennis with my friends. Krabi in Thailand. The beaches are great and it’s a short hop away. We all love Thai food so it’s a natural destination for us. Thanks so much to Nehal and Rhea for sharing their time with us on a beautiful afternoon! And thanks to the oh-so talented Irina Nilsson Photography for the lovely photos! #TEAMFOODSTERR at FHA Singapore 2018! Health food lovers, this one’s for you. Started less than a month ago, Foodsterr carries a variety of products such as chia seeds, quinoa, assortments of seeds and many other superfoods, including a peanut butter substitute spread made from mung beans that is almost entirely unavailable elsewhere. Foodsterr’s produce is sourced directly from farms and niche producers such as Murray River Organics in Australia, and Campos Brothers Farms in the US. As a result, this approach enables them to price their goods at a fraction of the cost of regular organic and health shops in Singapore, with the majority of their grains being sold at around $10 per 500g. If organic and affordable, hard-to-come-by foods are what you’re after, new online shop Foodsterr has got you covered, mama! Finding high-quality, not to mention affordable healthy foods here in Singapore can be a challenge, mama — we hear you! 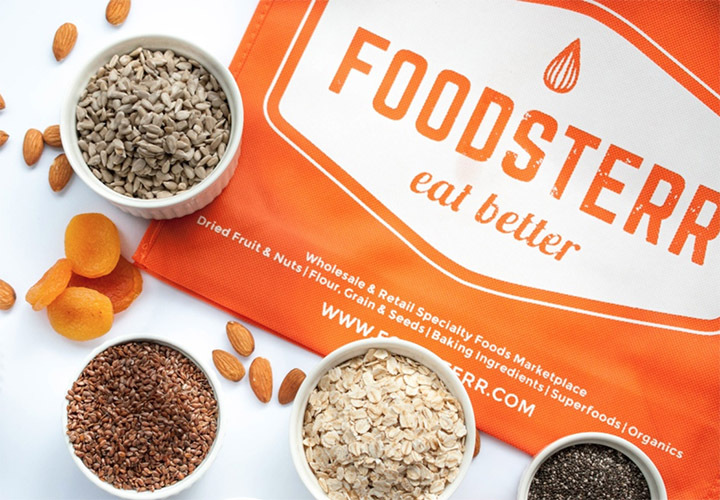 The good folks at Foodsterr heard you, too: it’s a new online haven for high quality food products like dried fruits, nuts, seeds, grains, superfoods, specialty flour and more. And because these are sourced directly from the world’s finest distributors, costs are kept down. Yes, miracles do exist! Launched with the goal of bringing affordable, healthy eating to the average Singaporean (including home cooks, bakers and the fitness-conscious), Foodsterr was created by a group of savvy food industry vets who believe in providing only the best quality for themselves and their families — and they know how to get it at a good price. The result is a collection of goods sourced from top distributors all over the world that commit to high standards of food safety and quality – a trueno-frills approach to healthy eating! You’ll also find many products you can’t locate anywhere else in Singapore, like nutritious Canihua seeds from Peru and organic flax meal from Canada, among many others. Got a kiddo with a nut allergy? Foodsterr’s got their hands on NotNuts Crunchy Butter straight from Oz! Concerned about keeping stuff fresh in the Singapore humidity? Don’t fret, mama! All Foodsterr products are kept in cold storage before being delivered, and each product is packed in high-grade, re-sealable European spec standup bags complete with waterproof labels, so you won’t have the problem of them disintegrating when taking the food in and out of the fridge! Whether you’re a mama looking for scrumptious healthy munchies for yourself and the bubs, or a bakery owner wanting the freshest, top-quality ingredients, Foodsterr offers both retail and wholesale options at the best prices, thanks to its exclusive online store with no existing retail shopfronts. Plus, they offer free shipping for orders over $100 — score. We’ve checked out their selection of some of our fave healthy staples – including rolled oats, quinoa, and almonds – are sure enough available at better prices than what you’ll find at the supermarket. Give ’em a look, mama! Sassy Mamas can get an exclusive 10% discount off Foodsterr purchases during the month of May. Just enter the code SASSY22 at checkout!